The leader lists his heavy demands on Europe. Europeans must: promise not to discuss Iranian missile programme, confront all USA’s sanctions on Iran, buy as much petrol as we deem necessary to sell, underwrite financial transactions both in private and public sector….etc. Has Europe the means and is willing to confront the USA? 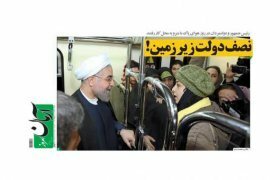 Before him, Hassan Rouhani had said: The country will be well run with or without JCPOA. For Hassan Rouhani, JCPOA was the all-purpose internal problem solver… Was it not? A country’s credibility relies on the nation’s self-confidence to evolve with its legitimate authorities. Today, the legitimacy of the clerics is endangered, but the citizenry lacks the constructive patriotism to engage in building a unified nation to devise a new legitimate authority. The theocracy survives by the influence of a small elite, abusing the religious ideology and the political concepts inherited from the Islamist revolutionaries. Almost in every sentence, and no matter the subject, the Vali-e Faqih, Ali Khamenei, peppers his speeches with two words, Revolution (انقلاب) and Islam (اسلام). He undermines the aspiration of those born after 1979 that see the world from different perspectives from their parents. 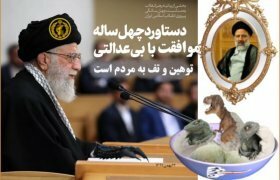 His valets – there is no better word to describe those who hold office in the Iranian government and institutions or who are the products of rigged elections – endlessly repeat the same two words, along with the paraphrase, as the Supreme Leader bade us to do, however nonsensical the order might be. The theocratic regime is a copycat of the monarchies before it: dictatorial, brutal and corrupt. If the monarchies did with a few men of merit and abilities, the autocrat clerics trust only those who can convince them of being one of theirs, thus cultivating hypocrisy and incapability beyond any admissible limit. 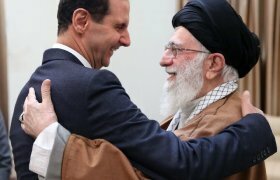 The regime’s valets crassly flaunt their own authority and boast to the world the powers that Iran has not. As long as the regime uses the old clerical receipts in manipulating citizenry to buy time and get results, things will stay as they have been for the last forty years. Iran’s complex and corrupt system, produced by gross government mismanagement, is justified and presented to the people by a jumble of meaningless snippets of insincere flattery that might only gladden the hearts of their obedient followers. The domestic media shamelessly and uncritically reproduce the jumble of words on the Glorious Islamic Revolution and on the ways Iran is able to show the world its strength as do China or Russia. They pretend to be mightier than the USA, already a relic to them. However, the claims are hot air. If the regime has the means of being a source of distress in regions of the Middle East, it is not a benign actor, especially for its own population. The empty shell in which the clerics have been living for years is cracking due to the spread of poverty and the corruption resulting from nepotism, greed and incompetence. Blaming the USA and the Europeans for the embargoes and sanctions effects on the domestic scene is only a turmeric poultice on a cancerous tumour. Pointing to external culprits creates smokescreens for a little while to justify further street shows honouring the Leader. But, there is no long-lasting salutary influence on the radical transformation that the country so badly needs. In an editorial, 24 May 2015, Shargh paper points out: If we were to be realistic and independent, we must seek the solution of our problems from within, we should not depend on external decisions. The growing #IranProtests – spreading in small cells all over the country – bring into the open the dissatisfaction of the professional bodies. They have no scope beyond satisfying their immediate demands. As long as the government may throw them some bare bones and lots of promises, they will go home peacefully. However, and this concerns the majority of protests, the government replies with violence to stifle them, and paradoxically, the protesters are met with a cold shoulder by the general public, members of which have their own demands. The citizenry is confused and lacks courage. As long as there was a monarchy, they could call them puppets of the foreign powers and have an excuse for their own miseries. Today, the Iranian born and bred clerics have produced the very same effects. The citizens have no outsider to blame for their hardship. They are now bewildered individuals who, finding themselves in difficulties on a variety of issues that are from their immediate needs, struggle to adjust to their personal situation. They would rather starve individually than break eggs to make a collective omelette. The generation that backed the Revolution in 1979, either by active participation or by keeping silent, has raised an overprotected and selfish generation, unable to envisage an alternative legitimacy. The sorry state of affairs is expressed when, here and there, people seek a new dictator to replace the decrepit clerics, or seek the United Nations to hold a referendum for the Iranian people that allows the citizens to choose a new form of governance. The worst of all the propositions for a regime change in Iran comes from some malefic groups, such as MEK – Mojahedin-e Khalq, which expect foreign powers to back them up in overthrowing the theocracy. The knowledge of the Iranian communities abroad in their country’s affairs nears zilch, except for a handful human rights activists, artists and journalists with little political influence. However, neither the clerics nor the #IranProtesters fully realise the erosion of the regime’s legitimacy and the peril of the political vacuum lying ahead. The #IranProtests have the dynamics of a rolling snowball. As they roll, they grow and sooner or later will smash the theocracy… but, then what? No society can survive political vacuum. If there is no vision to rear a new legitimate collective consensus, chaos will follow once the snowball has smashed against a tree. The vacuum will provide fertile grounds for the groupuscules, the fissiparous radical activist groups, and the assorted reactionary ranters that would fight each other, hence shedding blood, and creating even more hardship than before. A solemn pledge in serving the best interests of the nation is yet to be designed. It needs clear vision, and its leaders, women and men, must be committed to the new legitimacy. For now, the Iranian nation’s ability in envisaging the future is meagre. As long as the social and political can be outlined in a public restless silence, only defying the system and Leader in private, the regime will not be seriously threatened. The clerics, by years of rancorous attitudes towards the outside world, have put a glass dome on the country under which the citizens have created their own little private world. 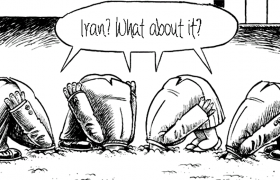 The Iranians duck the basic question: why is rearing a legitimate collective consensus so laborious that it nears impossible? The question holds a mirror in which they can see themselves as they are, far from what they wish to see. The Iranian football fans in Saint Petersburg, on June 15th before the Morocco–Iran match, encapsulated the sad divisions in the country. They were divided on the national anthems, whether to sing the pre-1979 one or the post-1979 one? Why not a new one? The Iran flag should bear in its centre the “lion and the sun” or the “Allah”, today’s official emblem? Why not one without any central imagery? Once more, as was the case in 1979, they looked into the rear mirror for a blurred future. A nation’s greatness can be found in its population’s ability to question their beliefs and accept the comments that hurt for their truth. Dignity and legitimacy are earned by the citizenry, not offered on a platter by a foreign power, or the acceptance of a new dictator.